The Trump administration released its Fiscal Year 2018 budget request for the federal government on Tuesday, May 23, 2017. 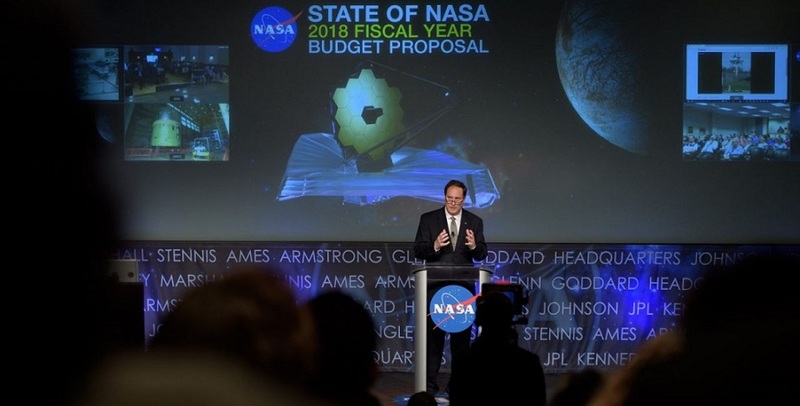 Much of what was proposed for NASA remains the same as what was seen in the “skinny budget” back in March, including the elimination of the agency’s Office of Education and several Earth Sciences missions. If the request for NASA goes through Congress as is, the U.S. space agency would receive $19.1 billion. With that includes funding for the continued development of the Space Launch System, Orion crew vehicle, and the continued development of the Commercial Crew Program, among other things. While the budget is essentially flat from the 2017 omnibus bill passed earlier this year, in order to increase more deep space activities several programs and missions were canceled. The biggest elimination is arguably NASA’s Office of Education. There will be $37 million provided for close-out costs, but that is it. Hunter said internships, fellowships, and outreach activities such as social media, are funded outside the Office of Education and will continue. Moreover, the Science Mission Directorate’s STEM Science Activation program will continue as well. There are about 60 jobs that will be affected by this, according to Hunter. However, all of them will either be transferred to other areas around NASA or eliminated once employer contracts are up. For NASA’s Earth Sciences, while the proposed budget still includes funding for 18 Earth-observing missions in space as well as airborne missions, it does eliminate the Carbon Monitoring System and reduces funding for Earth science research grants. Additionally, it is proposed that the Plankton, Aerosol, Cloud, ocean Ecosystem mission; the Orbiting Carbon Observatory-3; the Radiation Budget Instrument; DSCOVR Earth-viewing instruments; and the Climate Absolute Radiance and Refractivity Observatory Pathfinder mission all be terminated. Indeed, NASA will see an increase in planetary science and astrophysics. The budget would fully fund the continued development of the Mars 2020 rover and formulation of Europa Clipper, albeit without a Europa lander. Additionally, Lucy and Psyche, NASA’s two newest asteroid science missions, will also be fully funded. The budget also supports the operation of 10 planetary missions, including the Opportunity rover, which has been on Mars since 2004. As for the Asteroid Redirect Mission, that will be canceled. However, Hunter said all of the central technology development, such as solar electric propulsion, will continue outside of the program. While funding for SLS, Orion, and the Commercial Crew Program will see decreases in 2018, Hunter said a lot of that has to do with the development winding down. For example, starting as early as next year, NASA will certify Boeing and SpaceX to send crews to the International Space Station. The costs will then shift from spacecraft development to paying for crewed flights to the outpost. One thing that was absent from the budget was the recently talked about Deep Space Gateway. According to Hunter, it isn’t in the budget because it still requires some “introduction activity” for support in the Trump administration and Congress. Regardless, Lightfoot is optimistic about the budget. Additionally, Lightfoot said having an additional crew member on the International Space Station in 2018, in part because of the Commercial Crew Program, will allow the station to greatly enhance the research and advancement toward exploration. The FY 2018 budget request still needs to go through both houses of Congress before being signed by the president. As such, the final budget could look different than what is being proposed.